Sometimes, I like to dream of impossible or over-the-top foods — a giant bagel turned into a pizza, a one-litre bottle of Yakult, or even super-sized desserts… Mmm. Sinful, but so good. 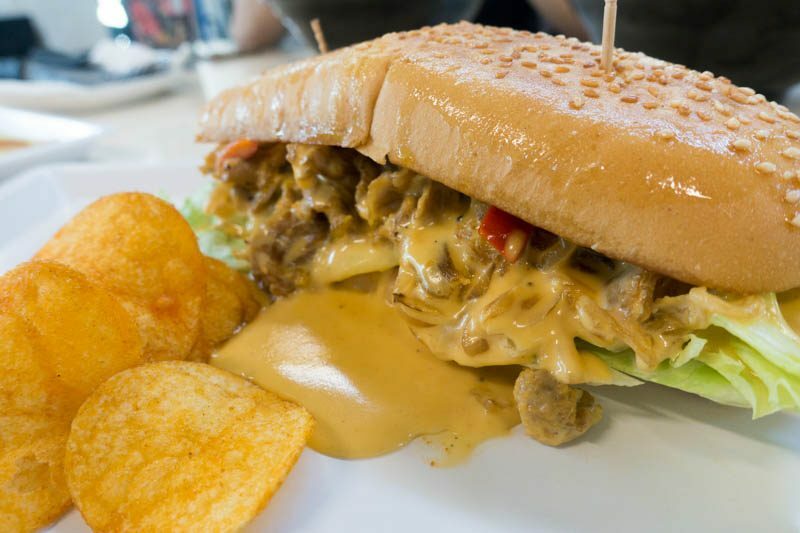 Now, imagine an innocuous roti john stuffed to the brim with cheeseburger ingredients, such as savoury minced meat, fresh lettuce, onions, cheese and tomatoes, and then drenched with a cheesy nacho sauce. Think that’s a dream? 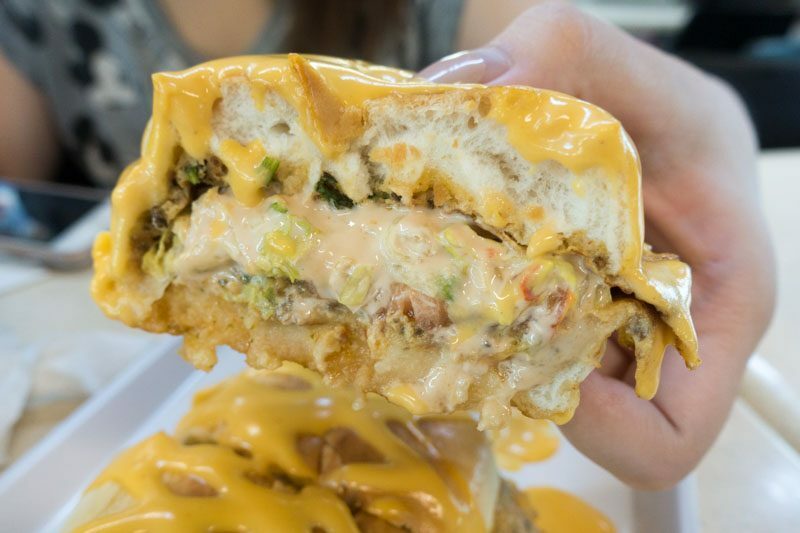 Think again – that’s The Bread Gang’s Roti John Cheeseburger (S$7.90) for you. And yes, it exists. Right here in Jurong East. 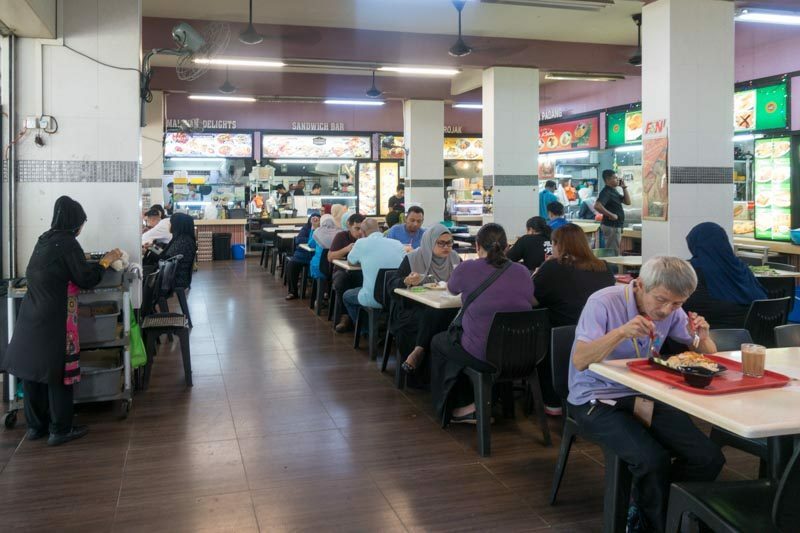 Tucked away beneath Block 235 along Jurong East Street 21, The Bread Gang is located within Aiman Cafe, a halal coffee shop that sells a variety of popular Muslim food, such as nasi padang, fried chicken, mee soto and more. 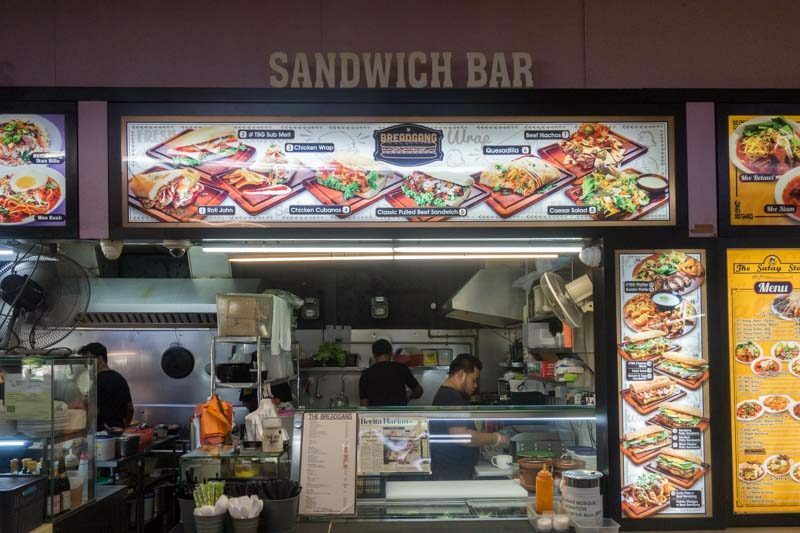 It took me a while to locate The Bread Gang because its signboard was labelled as ‘Sandwich Bar’, but I found it nonetheless by recognising the various mouthwatering sandwiches and burgers it had on its menu. 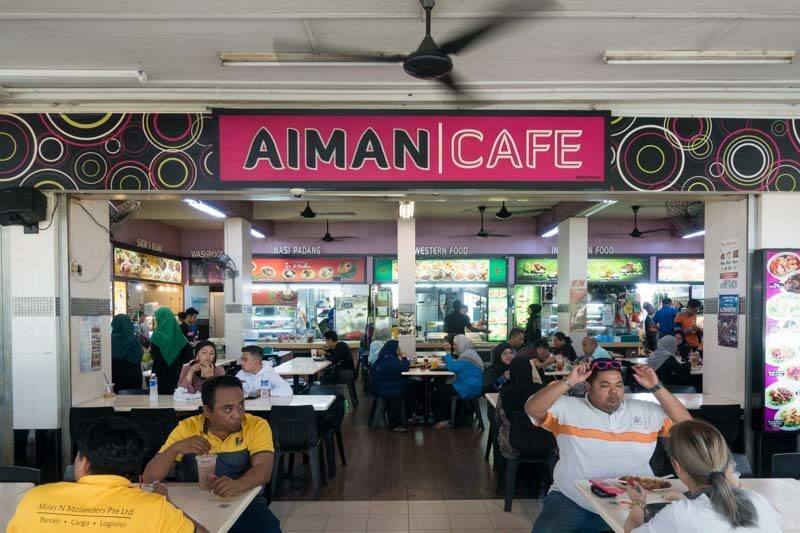 As a coffee shop, Aiman Cafe’s interior is nondescript at best. However, I liked it that there were plenty of overhead fans so the dining area wasn’t too stuffy or hot and that there was a large walkway in the middle of the coffee shop so you wouldn’t have to worry about squeezing into small aisles between tables to get to your seat. 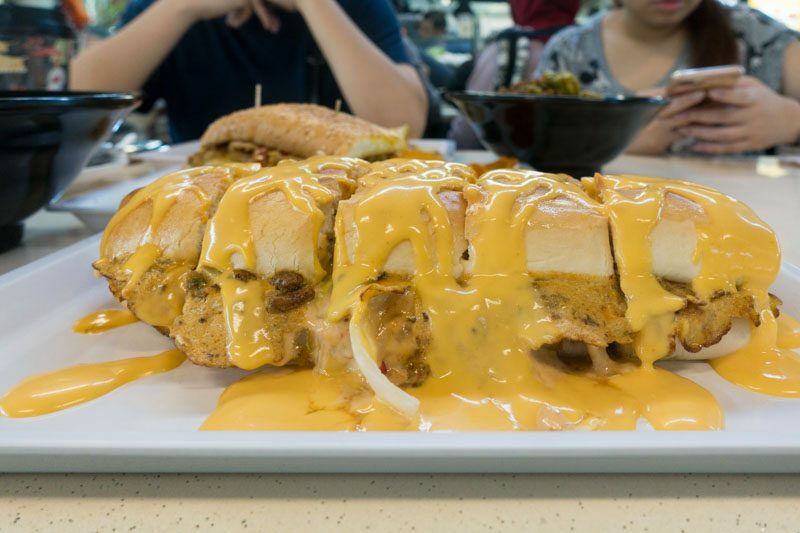 No doubt the star dish on The Bread Gang’s menu, the Roti John Cheeseburger (S$7.90) was a massive roti john stuffed with what seemed like egg, minced meat and vegetables (honestly it was hard to tell because the sauce covered everything), and then generously doused in a creamy nacho cheese sauce. It was divided into 10 large chunks, perfect for sharing with a large group of friends. If the nacho dressing is enough to make you go, “Oh, that’s way too much for me”, then you’ll be floored by what’s inside the roti john. It was a glorious mess of creamy mayo sauce, lettuce, egg, minced meat, onions and tomatoes. 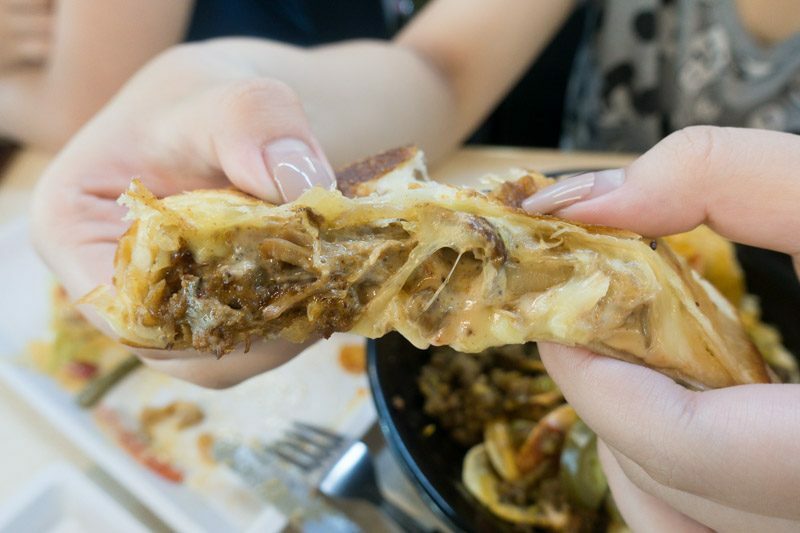 Fair warning: There’s no way to eat this roti john without creating a mess. The minute I bit into the roti john, an intense and sweet creaminess from both the nacho cheese and the creamy mayo sauce hit me. Then, the savoury cheese hit my tastebuds. After that, there was an audible crunch from the fresh lettuce, tomato and onions, and last but not least, I finally tasted the tender morsels of peppery minced meat. While there was an overwhelming amount of creamy sauce in the roti john, there was an equally fair attempt to balance that out with the firm loaves of bread, thinly-fried egg, and the fresh vegetables. Taste-wise, a lot of the flavours were drowned out (literally) by the cheese, but the cheesy roti john was still no doubt satisfying, indulgent and utterly delicious. The #TBG Cheesesteak (S$7.50) was a huge sandwich served with shabu shabu beef, lettuce, a creamy mayo sauce, as well as spicy barbecue chips on the side. While I was initially resolved to down this entire sandwich by hand, I ended up using cutlery because the shabu shabu beef was so tender that it kept falling off the sandwich. The #TBG Cheesesteak was buttery and slightly toasted on the outside, and though the creamy mayo sauce had soaked the inner layer of the bread, the bread was still pleasantly pillowy soft. I loved the combination of flavours. The creamy mayo was tangy with a hint of peppery spice while the shabu shabu beef was sweet and juicy, and there was a refreshing crunch from the large sheets of lettuce, bell pepper and caramelised onions. My only gripe would be that the creamy mayo sauce was a tad too overpowering, so at times I could only taste that and nothing else. 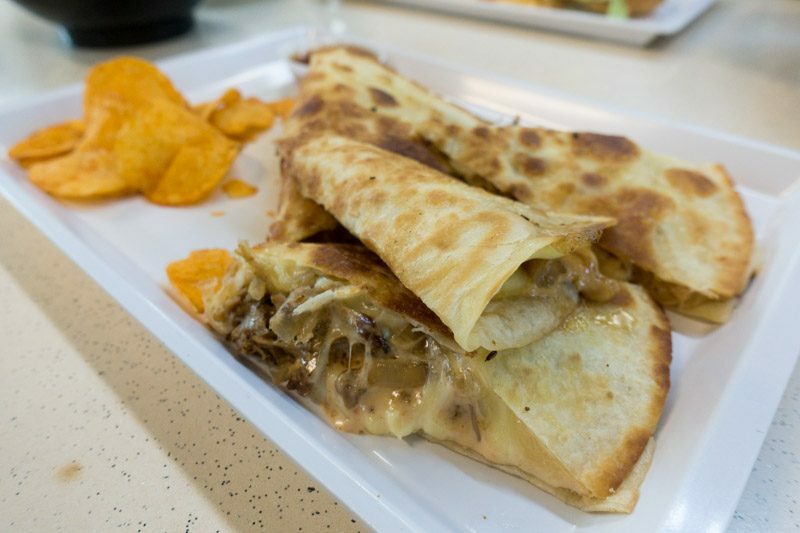 The Bread Gang also offers quesadillas, such as the Chicken Quesadilla (S$8.50). Tender pieces of juicy grilled chicken were topped with cheese, wrapped in a soft quesadilla, and toasted on a grill before being served with a handful of spicy chips and a sweet Thai chilli sauce. This was a dish I really enjoyed. The quesadilla was soft, warm and springy, just like a pan-fried egg, while the mayo sauce was mild and sweet. The grilled chicken was crispy and cut into thin strips, while the cheese was stringy, gooey, and sinfully indulgent. Dipping it into the sweet Thai chilli sauce gave it a sharp and spicy kick, which cut through the honeyed sweetness from the mayo sauce, and whet my appetite. The bread-to-meat ratio was just right, and with every bite, I could taste the fluffiness from the quesadilla while enjoying the meaty goodness from the grilled chicken strips. More importantly, the mayo sauce wasn’t too overwhelming, and I could taste savoury and sharp notes from the cheese as well. Another dish that I tried was the Beef Rendang Nachos With Cheese & Salsa (S$7.50). It came in a massive bowl, topped with beef rendang chunks, thickly sliced jalapeños, cheese and salsa. Every bite tasted like what I’d expect if I had bit into a regular beef cheeseburger, but with nachos instead of bread. The salsa was tangy while the tomatoes helped to give each bite a tart and sour kick, and the beef rendang was peppery and slightly spicy, but was filled with salty and umami flavours. The nacho cheese wasn’t particularly overwhelming, which I was pretty thankful for because there were already so many different flavours going on in this bowl, and I didn’t want it drowned out by gooey nacho cheese. Do note that the nachos became soggy quickly and it was hard to lift up whole chips without it breaking off, so I ended up using my fork to dive into the beef rendang instead. One of my personal favourites, The Bread Gang’s Caesar Salad (S$7.50), had the stall’s own interpretation imposed on it, such as replacing the iconic creamy Caesar salad dressing with a sesame-based dressing, topping off the salad with grilled chicken, and sprinkling it with crushed nacho chips. For those looking for a healthier alternative to a burger but still craving for that indulgent, savoury element, this salad is definitely for you. 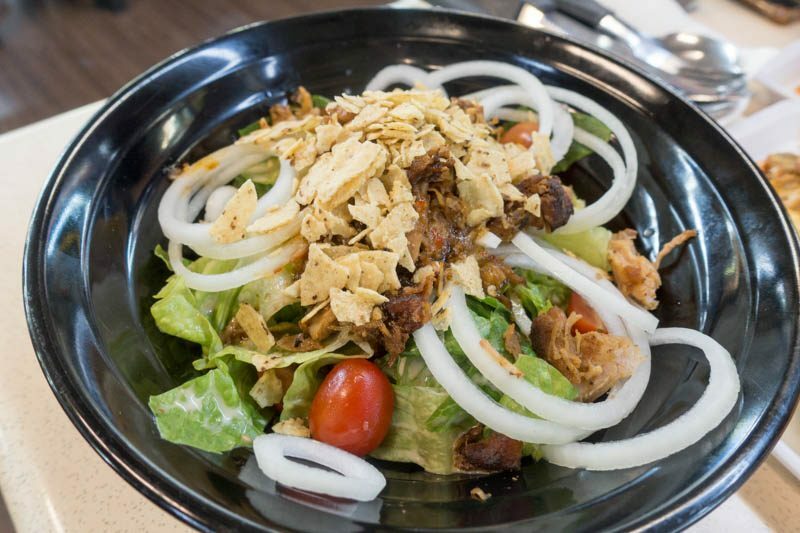 Every forkful of salad had different ingredients in it: grilled chicken, crunchy lettuce, raw onions (which came in whole rings), baby tomatoes, and crispy nacho bits. The Bread Gang definitely got the ratio of ingredients right, because I was constantly digging up something different with every bite. While the typical Caesar salad has parmesan cheese shavings and a boiled egg, The Bread Gang’s version of this classic salad had none of that. 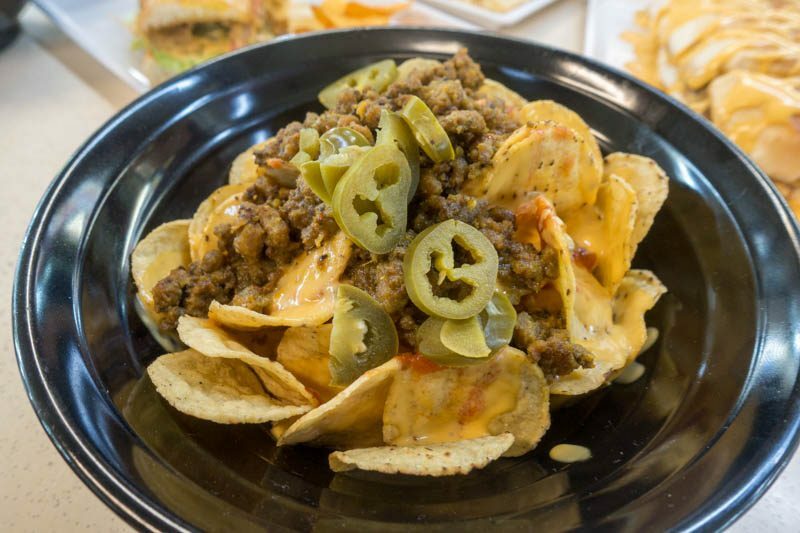 Instead, it had a sesame-based sauce with hints of lemon juice that was light and refreshing, and topping it off were crushed nacho chips, which gave a surprising crunch to every bite. A meal at The Bread Gang isn’t one for the faint-hearted. 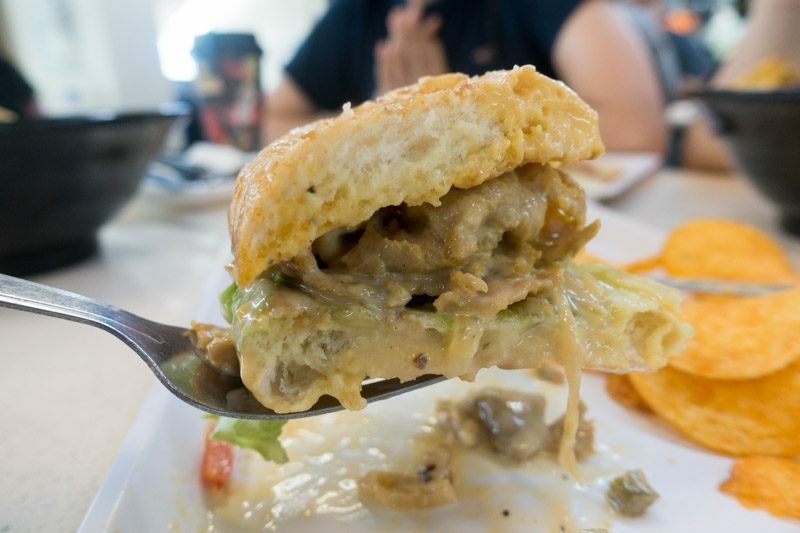 Majority of its sandwiches, burgers and sides are drenched in either nacho cheese or its signature creamy mayo sauce, making every bite indulgent and satisfying. Some might say it’s even borderline unhealthy, and as I got through half the meal, I’d have to agree. 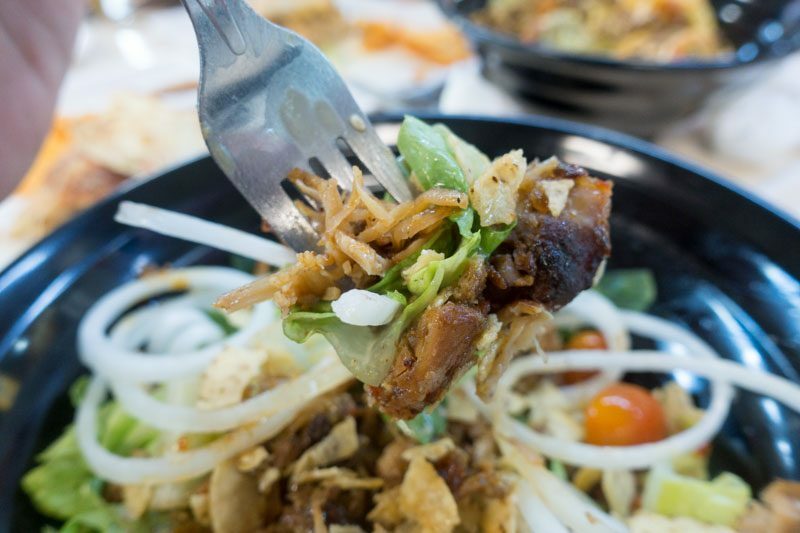 Though the portions are certainly huge and filling, because most of the dishes are drenched in sauce, the authentic taste of the sandwich or burger’s ingredients, such as shabu shabu sliced beef or beef rendang morsels, are overpowered. Thankfully, not all of its dishes were like that. Some of its dishes were completely spot-on in terms of ratio of ingredients and flavours. For example, I really enjoyed the quesadillas, nachos and salad, and found them well-executed and delicious.